Much of Britten's choral music requires great vocal dexterity and suppleness. Polyphony continue to receive great critical acclaim for their performances so are the perfect group to record this repertoire. 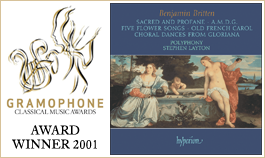 Included on this recording is the last choral work for professionals which Britten was to complete—Sacred and Profane—a collection of eight medieval lyrics for voices in five parts (SSATB). Also included is the Chorale after an old French Carol whose text is by W H Auden (a close friend of Britten's). The Chorale's text was part of an unachieved Christmas Oratorio on which Britten and Auden intended to collaborate. The seven settings of poems by Gerard Manley Hopkins entitled A.M.D.G. were never performed in the composer's lifetime and indeed had to wait until 1984 for their first performance. Britten’s Five Flower Songs date from the spring of 1950 and were first performed privately on 23 July of that year at Dartington Hall, by a student choir conducted by Imogen Holst (who went on to become Britten’s amanuensis at Aldeburgh two years later). The songs were dedicated to Leonard and Dorothy Elmhirst as a silver-wedding present, and appropriately celebrated the couple’s love of botany. The first performance was an outdoor affair mounted specially for the dedicatees, who owned Dartington and had contributed generously to the cost of setting up Britten’s English Opera Group three years before. By this stage in his career, Britten had already shown himself to be an accomplished setter of English pastoral poetry (notably in the Serenade of 1943), and his response to the texts by Herrick, Crabbe and Clare is economical, imaginative and assured. The Crabbe text, ‘Marsh flowers’, must have had a special appeal for the composer, since it had been Crabbe’s poetry that inspired him to return to Suffolk from the USA in 1942 to compose the opera Peter Grimes, based on Crabbe’s epic poem The borough. In the final flower song, ‘Ballad of green Broom’, Britten depicts a strummed lute accompaniment with a dexterity recalling the imitations of instrumental sonorities in his Hymn to St Cecilia, composed on his voyage home from America. In spite of an astonishing technical facility which might have led a less discriminating composer astray, the young Britten exercised a rigorous policy of self-criticism which inevitably resulted in his withdrawing several of his early works from circulation soon after their composition. In some cases, most notably the American operetta Paul Bunyan (1941), the suppression was due to poorly received performances; but it is difficult to know exactly why Britten withdrew the seven settings of poems by Gerard Manley Hopkins entitled A.M.D.G., which were never performed in the composer’s lifetime. Sketched in August 1939, shortly after Britten’s arrival in the United States, the songs were originally intended for performance by Pears’s ‘Round Table Singers’ in London during November of that year. Possibly the decision to remain in the USA for several years influenced Britten to abandon the project before he had made a fair copy of the manuscript. It was only as recently as 1984 that A.M.D.G. was given its first performance, and the work was finally published in 1989 (without its original opus number—17—which had been reallocated to Paul Bunyan when Britten revised the operetta in 1976). The initials ‘A.M.D.G.‘ stand for a famous motto of the Jesuits (Ad maiorem Dei gloriam—‘to the greater glory of God’), a sect which Hopkins had joined in his early twenties. Several of Hopkins’s poems, including O Deus, ego amo te (set by Britten), bear this motto in their manuscripts. (None of Hopkins’s poetry appeared in print before his death in 1889, and it was not until 1918 that Robert Bridges supervised the publication of the first collected edition.) Britten’s setting of Prayer I (‘Jesu that dost in Mary dwell’) indulges in a harmonic richness absent from some of the other more frugal settings, and is followed by Rosa mystica, a ternary waltz in which parallel thirds are set against a pedal point in ostinato rhythms. God’s grandeur contains fugal elements and graphic chromatic depiction of the words ‘bleared’ and ‘smeared’. The preoccupation of Prayer II (‘Thee, God, I come from, to thee go’) is simple octave doublings, and this directness is maintained in O Deus, ego amo te, where the music consists almost entirely of root-position major triads in unmeasured speech rhythms. The interval of a third returns to dominate the march-like setting of The soldier, and the final song (Heaven- Haven) sets one of Hopkins’s earliest poems to music of the utmost simplicity. Britten wrote a considerable quantity of music during his school years, much of it ambitious and demonstrating a striking stylistic eclecticism. Much simpler in its understated poignancy is his well-known A Hymn to the Virgin, for double choir, composed on 9 July 1930 during an enforced spell in the sick-bay at Gresham’s School, Holt, when Britten was only sixteen years old. (This was his final year at school, and two months later he entered the Royal College of Music to study composition and piano.) In 1934 he deemed the piece worthy of publication but transposed the music down a semitone to make it more comfortable to sing and amended some of the harmonic progressions. Britten’s opera Gloriana, Op 53, was first performed at a gala event at the Royal Opera House, Covent Garden, on 8 June 1953 in the presence of Queen Elizabeth II, in honour of whose coronation (which had taken place just six days before) the work had been composed. Although popular with the general public, who flocked enthusiastically to the early run of performances, the opera was harshly treated in the national press: critics who were already sceptical of the composer’s meteoric rise to fame were delighted that the audience at the gala premiere—largely made up of unmusical diplomats and other dignitaries—was baffled by the work, and offended by its warts-and-all portrayal of an ageing monarch. Always pathologically sensitive to criticism, Britten made little attempt to promote the opera after this unfortunate debacle and it only became established in the mainstream operatic repertory many years after his death. He nevertheless salvaged certain parts of the score and sanctioned their use in concert performances. The set of six Choral dances from ‘Gloriana’ for unaccompanied chorus was first performed by the BBC Midland Chorus in a broadcast on 7 March 1954; the set was later rearranged to include tenor solo and harp obbligato for a performance to mark the opening of the Queen Elizabeth Hall, London, in 1967. The dances occur in the first scene of the opera’s second act, which portrays a colourful masque at Norwich’s Guildhall attended by Queen Elizabeth I during a royal progress. Britten had intended this scene to combine vivid pageantry with a homage to Elizabethan song and dance, but later felt that it impeded the dramatic flow of the opera as a whole, and in some later productions the entire scene was cut. The sequence begins with the appearance of the demigod Time, ‘lusty and blithe’, who is followed by his wife Concord. Her song is set to music made up entirely of concords, a deliberate witticism on Britten’s part. After Time and Concord have danced together, country girls, rustics and fishermen join in the celebrations before the concluding ‘Dance of homage’ to the visiting sovereign. During his early career, Britten undertook occasional commissions from the BBC in order to supplement his longer-term concert and operatic work. In the autumn of 1944 he contributed music to a radio programme entitled A Poet’s Christmas, broadcast by the Home Service on Christmas Eve and also featuring music by Michael Tippett. Britten’s contribution was his Chorale after an old French Carol, with a text by W H Auden (who had been Britten’s close friend and collaborator in the period from 1936 to 1942). The Chorale’s text was part of an unachieved Christmas Oratorio on which Britten and Auden intended to collaborate. Britten’s setting is based on the hymn tune ‘Picardy’, known in France as ‘Romancero’; it lay unperformed for many years, but was resurrected in 1961 when Imogen Holst conducted its first airing since the original broadcast in 1944. Sacred and Profane, Op 91, a collection of eight medieval lyrics for voices in five parts (SSATB), was written in the winter of 1974/75 for Peter Pears’s Wilbye Consort, who gave the first performance of the songs at Snape Maltings on 14 September 1975 (and subsequently recorded them in the following year, less than two months before Britten died). Sacred and Profane proved to be the last choral work for professionals which Britten was to complete, although he went on to compose the Welcome Ode for amateurs in 1976 and left the score of a Sitwell setting for choir and orchestra (Praise we great men) unfinished on his death. The medieval lyrics were conceived as a virtuoso display piece for the five solo voices which made up the Wilbye group, but Sacred and Profane has since occasionally been performed by full choirs in spite of the extraordinary vocal dexterity and suppleness required to bring off this highly demanding work in performance: the harmonic sophistication of Britten’s late style requires an impeccable sense of relative pitch difficult even for soloists to achieve, and almost impossible for any but the best choirs. It would be misleading to regard Sacred and Profane as a song-cycle in the conventional sense since, although there are sporadic musical connections between the eight individual songs, the set does not display unified subject-matter. The composer’s main concern was to create a juxtaposition of secular and sacred typical of the medieval period. Britten chose not to modernize his texts, some of which date from as early as the twelfth century, so a summary of their content may prove helpful. The work begins with St Godric’s simple Hymn to the Virgin Mary, then briefly bewails man’s habitual insanity as a characteristic making him unique in the animal kingdom (‘I mon waxe wod’). ‘Lenten is come’ provides a detailed description of the sights and sounds of emerging springtime, but is immediately followed by a cold windy night signifying the drawing in of winter (‘The long night’). The fifth song, ‘Yif ic of luve can’, presents the intense feelings of love and sorrow inspired by a contemplation of Christ on the Cross. The mood switches abruptly to one of irreverent parody in the ensuing ‘Carol’, where a pastoral scene of a maiden lying on a moor is related in deliberately banal harmonic and rhythmic patterns. In ‘Ye that pasen by’, Christ makes an entreaty to passers-by to behold him on the Cross; and the set concludes with ‘A death’, in which a catalogue of the breakdown of bodily functions at the moment of death leads to a surprisingly dismissive conclusion (‘Of al this world ne give I it a pese!’). Les Five Flower Songs, op. 47, de Britten datent du printemps 1950. Le 23 juillet de cette année-là, au Dartington Hall, eut lieu la première audition, privée, avec un chœur d’étudiants placé sous la direction d’Imogen Holst (qui devint une des copistes de Britten à Aldeburgh deux ans plus tard). Dédiées à Leonard et Dorothy Elmhirst, ces mélodies étaient conçues pour célébrer leurs noces d’argent et fêter leur amour commun pour la botanique. La première audition eut lieu en plein air, arrangée spécialement pour les dédicataires, propriétaires de Dartington et généreux mécènes de l’English Opera Group que Britten avait créé trois ans auparavant. À ce stade de sa carrière, Britten avait prouvé qu’il savait mettre en musique avec bonheur la poésie pastorale anglaise (en particulier avec la Serenade de 1943) et sa réponse aux textes de Herrick, Crabbe et Clare est économique, imaginative et assurée. Le texte de Crabbe «Marsh flowers» a dû certainement émouvoir plus particulièrement Britten, puisqu’en 1942, c’était déjà la poésie de Crabbe qui l’avait incité à quitter les États-Unis pour retrouver son Suffolk natal et composer son opéra Peter Grimes sur The borough, un poème épique de ce dernier. Dans la dernière mélodie, «Ballad of green Broom», Britten dépeint un accompagnement gratté de luth avec une dextérité rappelant les imitations des sonorités instrumentales de son Hymn to St Cecilia, composé durant la traversée qui, d’Amérique, le ramenait chez lui. En dépit d’une facilité technique étonnante qui aurait égaré un compositeur doué d’une capacité de jugement moindre, le jeune Britten pratiquait assidûment l’autocritique si bien qu’il retira de son catalogue plusieurs de ses œuvres de jeunesse peu après les avoir composées. Parfois, à l’image d’un des exemples les plus fameux, l’opérette Paul Bunyan (1941), il fallait en trouver la cause dans la mauvaise réception de l’œuvre. Mais il est difficile de saisir précisément pourquoi Britten retira les sept mélodies sur des poèmes de Gerard Manley Hopkins intitulés A.M.D.G.. Elles ne furent jamais exécutées du vivant du compositeur. Esquissées en août 1939, peu après son arrivée aux USA, ces mélodies étaient initialement conçues pour être données par les «Round Table Singers» de Pears à Londres au cours du mois de novembre de cette année-là. Peut-être sa décision de rester aux États-Unis pendant plusieurs années conduisit-elle Britten à abandonner le projet avant même d’avoir recopié le manuscrit. Ce n’est qu’en 1984 que A.M.D.G. fut donné en première audition. Et il fallut attendre 1989 pour voir cette œuvre finalement publiée (en omettant le numéro d’opus original, le 17—que Britten avait attribué à Paul Bunyan lors de sa révision en 1976). Les initiales A.M.D.G. font référence à une célèbre devise des Jésuites (Ad maiorem Dei gloriam, «pour la plus grande gloire de Dieu»), un ordre religieux qu’Hopkins rejoignit au début de ses vingt ans. Il inscrivit d’ailleurs cette devise sur le manuscrit de plusieurs de ses poèmes dont O Deus, ego amo te que Britten mit en musique. (Aucune poésie de Hopkins ne fut imprimée de son vivant—il décéda en 1889—et ce n’est qu’en 1918 que Robert Bridges supervisa la première édition de ses œuvres complètes.) La musique que Britten écrivit pour Prayer I («Jesu that dost in Mary dwell») s’autorise une richesse harmonique absente de quelques-unes de ses pages plus frugales. S’ensuit Rosa mystica, une valse ternaire où des tierces en parallèle évoluent sur une pédale de rythmes en ostinato. God’s grandeur contient des éléments fugués et une illustration graphique et chromatique sur les mots «bleared» («larmoyé») et «smeared» («coulé»). Quant à Prayer II («Thee, God, I come from, to thee go»), son sujet est traité par de simples doublures d’octave. Cette même simplicité franche se poursuit dans O Deus, ego amo te, où la musique s’appuie pratiquement uniquement sur des accords parfaits majeurs en position fondamentale sur lesquels se fait entendre les paroles dans un rythme libre. L’intervalle de tierce revient pour jouer un rôle crucial dans The soldier, et la dernière mélodie (Heaven-Haven) met en musique un des poèmes les plus anciens de Hopkins avec une simplicité épurée. Durant ses années d’écolier, Britten écrivit une quantité considérable de musique dont une bonne part s’illustre par sa nature ambitieuse et son éclectisme stylistique saisissant. D’une plus grande simplicité dans la retenue de ses émotions, le célèbre A Hymn to the Virgin pour double chœur vit le jour le 9 juillet 1930, alors que Britten, âgé de seize ans seulement, faisait un séjour forcé à l’infirmerie de Gresham’s School, un pensionnat de Holt, une ville côtière du Norfolk. (Ce devait être sa dernière année de scolarité générale puisque deux mois plus tard, il entrait au Royal College of Music de Londres pour étudier la composition et le piano.) En 1934, il jugea la pièce digne d’être publiée, mais la transposa au demi-ton inférieur pour en faciliter l’exécution vocale et amenda quelques marches harmoniques. L’opéra Gloriana, op. 53, de Britten connut en guise de première une soirée de gala exceptionnelle en ce 8 juin 1953, à l’Opéra royal de Covent Garden (Londres), en présence d’Elisabeth II, couronnée seulement six jours auparavant. Cet hommage musical, composé pour le couronnement, fut accueilli avec enthousiasme par le grand public qui se pressa nombreux pour assister aux représentations. Et pourtant, il fut sévèrement traité par la presse nationale: la critique, plus que jamais sceptique envers ce compositeur qui avait accédé à la gloire à une vitesse météorique, n’avait pu que se réjouir de la réaction des spectateurs de la première, essentiellement des diplomates et autres dignitaires peu portés vers la musique—une stupéfaction offensée par le portrait sans complaisance d’un monarque vieillissant. Britten, que toute critique affectait de manière pathologique, n’essaya pas outre mesure de faire connaître son opéra après l’infortunée débâcle de la première, si bien que Gloriana n’entra dans le répertoire lyrique que plusieurs années après la mort du compositeur. Britten s’attacha toutefois à préserver certains passages de la partition et autorisa leur exécution au concert. La première audition du recueil de six Choral dances from «Gloriana» pour chœur seul fut donnée par le Chœur de BBC Midland lors d’une émission diffusée le 7 mars 1954. Le recueil fut ensuite remanié pour incorporer un solo de ténor et une harpe obligée à l’occasion de l’inauguration du Queen Elizabeth Hall, à Londres, en 1967. Tirées de la première scène du second acte de Gloriana, ces danses chorales dressent un portrait pittoresque de la représentation d’un «masque» bigarré se déroulant à la Guildhall de Norwich en présence de la reine Elisabeth I au cours d’un voyage royal. Dans cette scène, Britten avait souhaité joindre à un faste éclatant un hommage aux chansons et danses élisabéthaines. Par la suite, il eut l’impression qu’avec cette scène, c’était le déroulement de l’action dramatique de tout l’opéra qui marquait un temps d’arrêt, si bien qu’il l’omit des productions ultérieures. La séquence débute par l’entrée du demi-dieu Temps, «lusty and blithe» («vigoureux et joyeux») suivie de celle de son épouse Harmonie. Elle chante une mélodie où seules figurent des harmonies parfaites, un trait d’humour délibéré de la part de Britten. Puis, Temps et Harmonie dansent ensemble, rejoints par des jeunes filles, des paysans et des pêcheurs, puis les festivités prennent fin sur une «Danse d’hommage» à la souveraine. Durant la première période de sa carrière, Britten accepta les commandes occasionnelles de la BBC afin de supplémenter ses projets à long terme pour l’opéra et le concert. À l’automne 1944, il contribua à une émission radiophonique intitulée A Poet’s Christmas et diffusée par le Home Service la nuit de Noël—Michael Tippett s’était également fendu d’une partition. Quant à Britten, il écrivit son Chorale after an old French Carol sur un texte de W. H. Auden (ce dernier avait été l’ami et le collaborateur intimes de Britten de 1936 à 1942). Le texte du choral faisait partie d’un Oratorio de Noël inachevé auquel Britten et Auden avaient songé collaborer. La musique de Britten s’appuie sur la mélodie de l’hymne «Picardy» connu en France comme «Romancero». Personne ne toucha à cette page pendant de nombreuses années, jusqu’à ce qu’en 1961 Imogen Host la sorte des cartons et en dirige la première audition depuis l’émission originale de 1944. Sacred and Profane, op. 91, un recueil de huit mélodies médiévales pour cinq voix solistes (SSATB), vit le jour durant l’hiver 1974/75. Elles étaient destinées au Wilbye Consort de Peter Pears qui en donna la première audition à Snape Maltings le 14 septembre 1975 (et les grava l’année suivante, moins de deux mois avant la disparition de Britten). 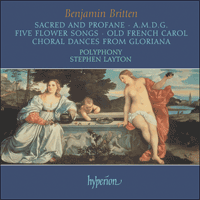 Sacred and Profane se trouva être la dernière œuvre chorale pour professionnels que Britten écrivit avant de rendre l’âme. Il composa Welcome Ode pour amateurs en 1976, et laissa inachevée une partition pour chœur et orchestre (Praise we great men) sur un texte de Sitwell. Ces chansons médiévales furent conçues comme des pièces virtuoses destinées à mettre en valeur les cinq voix solistes qui constituaient l’ensemble Wilbye. Depuis, Sacred and Profane a néanmoins été donné à l’occasion par des forces chorales plus importantes malgré la dextérité et la souplesse vocales extraordinaires requises afin d’animer cette œuvre exigeante: réclamant une oreille relative impeccable, la sophistication harmonique du style tardif de Britten témoigne d’une difficulté de réalisation certaine pour des solistes, et pratiquement impossible pour des formations chorales à l’exception des meilleures. Il ne serait pas exact de considérer Sacred and Profane comme un cycle dans l’acceptation conventionnelle du terme, puisque les connections musicales entre les huit mélodies ne sont que sporadiques et que l’ensemble ne révèle aucun sujet commun. Le compositeur désirait principalement créer une juxtaposition de séculier et de sacré à la manière de la période médiévale. Britten choisit de ne pas moderniser ses textes dont quelques-uns remontent au XIIe siècle, si bien qu’un résumé pourrait être d’une certaine utilité. L’ouvrage débute par un «Hymne» de Saint-Godric à la Vierge Marie tout en simplicité, puis une courte lamentation sur la folie habituelle de l’homme, un trait qui le rend unique au sein du royaume animal («I mon waxe wod»). «Lenten is come» s’illustre par une description détaillée du spectacle et des bruits de l’arrivée du printemps, immédiatement suivie par une nuit venteuse et glaciale indiquant que l’hiver n’est pas encore parti («The long night»). La cinquième mélodie, «Yif ic of luve can», dévoile les sentiments intenses de l’amour et du désespoir inspirés par la contemplation du Christ en Croix. Dans le «Carol» suivant, l’atmosphère se transforme soudainement en une parodie irrévérencieuse d’une scène bucolique dépeignant une jeune fille allongée dans la lande où les motifs harmoniques et rythmiques sont traités de manière on ne peut plus banale. Dans «Ye that pasen by», le Christ supplie les passants de le contempler sur la Croix et le recueil prend fin par «A death» qui fait le catalogue des fonctions du corps qui s’arrêtent au moment de la mort et qui se conclut de manière étonnamment incongrue («Of al this world ne give I it a pese!»). Brittens Five Flower Songs op. 47 stammen aus dem Frühjahr 1950 und wurden am 23. Juli jenes Jahres in Dartington Hall von einem studentischen Chor im privaten Kreis uraufgeführt. Dies geschah unter der Leitung von Imogen Holst (die zwei Jahre darauf als Brittens Assistentin nach Aldeburgh gehen sollte). Die Lieder sind Leonard und Dorothy Elmhirst als Geschenk zur Silberhochzeit gewidmet und sind deshalb besonders angemessen, weil sie die Liebe der beiden zur Botanik verherrlichen. Die Uraufführung fand im Freien speziell für die Widmungsträger statt, denen Dartington gehörte und die sich drei Jahre zuvor großzügig an den Kosten der Gründung von Brittens English Opera Group beteiligt hatten. In diesem Stadium seiner Karriere hatte sich Britten bereits als fähiger Vertoner englischer pastoraler Lyrik erwiesen (insbesondere mit der Serenade von 1943), und sein Umgang mit den Texten von Herrick, Crabbe und Clare ist sparsam, einfallsreich und stilsicher. Der Text von Crabbe, „Marsh flowers“, muß dem Komponisten besonders zugesagt haben, denn es war Crabbes Lyrik gewesen, die ihn dazu bewogen hatte, 1942 aus den USA in die englische Grafschaft Suffolk zurückzukehren, um die Oper Peter Grimes zu komponieren, die auf Crabbes Versepos The borough beruht. Im letzten Blumenlied „Ballad of green Broom“ stellt Britten eine geschlagene Lautenbegleitung so gekonnt dar, daß man sich an die Imitationen von Instrumentalklängen in seiner Hymn to St Cecilia erinnert fühlt, die er auf der Heimreise aus Amerika komponiert hatte. Trotz eines erstaunlichen technischen Geschicks, von dem sich ein weniger feinfühliger Komponist womöglich hätte hinreißen lassen, übte Britten rigorose Selbstkritik, was unweigerlich dazu führte, daß er mehrere frühe Werke bald nach ihrer Entstehung aus dem Verkehr zog. In einigen Fällen, insbesondere bei der amerikanischen Operette Paul Bunyan (1941), lag es daran, daß Aufführungen schlecht kritisiert worden waren; dagegen ist schwer festzustellen, warum Britten die sieben Vertonungen von Gedichten von Gerard Manley Hopkins mit dem Titel A.M.D.G. zurückzog, die zu Lebzeiten des Komponisten nie aufgeführt wurden. Im August 1939 kurz nach Brittens Ankunft in den USA skizziert, waren die Lieder ursprünglich zur Aufführung im November des Jahres durch Pears’ „Round Table Singers“ vorgesehen. Möglicherweise veranlaßte Brittens Entscheidung, mehrere Jahre in Amerika zu bleiben, ihn zur Aufgabe des Projekts, ehe er eine Reinschrift des Manuskripts angefertigt hatte. Erst 1984 erfuhr A.M.D.G. seine Uraufführung, und das Werk wurde schließlich 1989 veröffentlicht (ohne die ursprüngliche Opuszahl 17, die Britten Paul Bunyan zugeordnet hatte, als er die Operette 1976 überarbeitete). Die Initialen A.M.D.G. stehen für das bekannte Motto der Jesuiten (Ad maiorem Dei gloriam, d.h. „zum höheren Ruhme Gottes“)—Hopkins war mit vierundzwanzig Jahren in den Orden eingetreten. Mehrere von Hopkins’ Gedichten, darunter auch das (von Britten vertonte) O Deus, ego amo te, tragen im Manuskript dieses Motto. (Keines von Hopkins’ Gedichten wurde vor seinem Tod im Jahre 1889 veröffentlicht: Erst 1918 besorgte Robert Bridges die Publikation der ersten Ausgabe gesammelter Werke.) Brittens Vertonung von Prayer I („Jesu that dost in Mary dwell“) schwelgt in einer fugalen Üppigkeit, die einigen der bescheideneren Vertonungen abgeht. Es folgt Rosa mystica, ein dreiteiliger Walzer, bei dem parallel geführte Terzen in ostinaten Rhythmen gegen einen Orgelpunkt gesetzt werden. God’s grandeur enthält fugale Elemente und anschauliche chromatische Umsetzungen der Worte „bleared“ („getrübt“) und „smeared“ („beschmiert“). Prayer II („Thee, God, I come from, to thee go“) steht vorwiegend in schlichten Oktavverdopplungen, und diese Direktheit wird in O Deus, ego amo te fortgeführt, dessen Musik fast ausschließlich aus Durdreiklängen in der Grundstellung besteht und in taktlosen Sprachrhythmen gehalten ist. Das Intervall der Terz dominiert auch den marschähnlichen Satz von The soldier, und das letzte Lied (Heaven-Haven) vertont eines von Hopkins’ frühesten Gedichten mit Musik von äußerster Schlichtheit. Britten hat schon während seiner Ausbildung eine beachtliche Menge Musik geschrieben, darunter vieles, was ehrgeizig und in auffällig eklektischem Stil gehalten war. Wesentlich schlichter in seiner bescheidenen Eindringlichkeit ist seine bekannte A Hymn to the Virgin für Doppelchor, komponiert am 9. Juli 1930 während eines Zwangsaufenthalts im Krankenzimmer der Musikschule Gresham’s School in Holt. Britten war damals erst sechzehn Jahre alt. (Es war sein letztes Schuljahr; zwei Monate später begann er am Royal College of Music Komposition und Klavier zu studieren.) Im Jahr 1934 befand er das Stück der Veröffentlichung wert, transponierte es jedoch vorher einen Halbton abwärts, so daß es bequemer zu singen war, und berichtigte einige der harmonischen Fortschreitungen. Brittens Oper Gloriana op. 53 wurde am 8. Juni 1953 bei einer Galaveranstaltung im Royal Opera House, Covent Garden, im Beisein von Königin Elisabeth II. uraufgeführt, zu deren Krönung (ganze sechs Tage zuvor) das Werk komponiert worden war. Obwohl sie dem breiten Publikum zusagte, das mit Begeisterung in die ersten Vorstellungen strömte, kam die Oper in der überregionalen Presse schlecht weg: Kritiker, die den meteorhaften Aufstieg des Komponisten zum Ruhm mit Skepsis verfolgt hatten, waren beglückt, daß das Publikum der Galapremiere—das hauptsächlich aus unmusikalischen Diplomaten und anderen Würdenträgern bestand—das Werk unverständlich und die rücksichtslos realistische Darstellung einer alternden Monarchin anstößig fand. Britten, der auf Kritik immer krankhaft empfindlich reagierte, bemühte sich nach diesem unseligen Debakel kaum noch um die Oper, und sie setzte sich erst viele Jahre nach seinem Tod im gängigen Opernrepertoire durch. Immerhin aber verwertete er Teile der Partitur wieder und gestattete ihre Verwendung bei konzertanten Aufführungen. Die sechs Choral dances from „Gloriana“ für unbegleiteten Chor wurden vom BBC Midland Chorus anläßlich einer Rundfunksendung am 7. März 1954 erstmals aufgeführt; die Zusammenstellung wurde später für eine Aufführung zur Eröffnung der Londoner Queen Elizabeth Hall im Jahr 1967 mit Tenorsolo und Harfen-Obligato neu bearbeitet. Die Tänze stammen aus der ersten Szene im zweiten Akt der Oper, die ein farbenfrohes Maskenspiel im Zunfthaus von Norwich darstellt, wo die Königin Elisabeth I. auf einer königlichen Rundreise zu Gast war. Britten hatte die Absicht, in dieser Szene buntes Gepränge mit einer Huldigung an elisabethanischen Gesang und Tanz zu verbinden, kam jedoch später zu der Ansicht, daß sie den übergreifenden dramatischen Fluß der Oper behinderte, und bei einigen späteren Inszenierungen wurde die ganze Szene gestrichen. Die Sequenz beginnt mit dem Auftritt des Halbgottes Time („Zeit“), der als „stramm und unbekümmert“ beschrieben wird, gefolgt von seiner Gemahlin Concord („Eintracht“). Ihr Lied ist mit Musik unterlegt, die ausschließlich aus Konkordanzen besteht, ein geistreicher Einfall Brittens. Nachdem Time und Concord miteinander getanzt haben, beteiligen sich Landmädchen, Bauernburschen und Fischer an den Feierlichkeiten, ehe der abschließende „Dance of homage“ dem königlichen Gast huldigt. Zu Beginn seiner Laufbahn nahm Britten gelegentlich Aufträge vom BBC-Rundfunk an, um sein längerfristiges Konzert- und Opernschaffen zu ergänzen. Im Herbst 1944 trug er Musik zu einer Radiosendung unter dem Titel A Poet’s Christmas („Dichterweihnacht“) bei, die am Heiligabend vom Sender Home Service ausgestrahlt wurde und auch Musik von Michael Tippett enthielt. Brittens Beitrag war sein Chorale after an old French Carol auf einen Text von W. H. Auden (der von 1936 bis 1942 ein enger Freund und Mitarbeiter Brittens gewesen war). Der Text des Chorals gehörte zu einem nie vollendeten Weihnachtsoratorium, an dem Britten und Auden gemeinsam hatten arbeiten wollen. Brittens Vertonung beruht auf dem Hymnus „Picardy“, der in Frankreich als „Romancero“ bekannt ist; sie blieb lange Zeit unaufgeführt in der Schublade, wurde jedoch 1961 ausgegraben, als Imogen Holst die erste Darbietung seit der ursprünglichen Ausstrahlung von 1944 leitete. Sacred and Profane op. 91, eine Sammlung von acht mittelalterlichen, für fünfstimmigen Gesang (SSATB) bearbeiteten Texten, entstand im Winter 1974/75 für Peter Pears’ Wilbye Consort, die die Uraufführung der Lieder am 14. September 1975 in Snape Maltings besorgten (und sie im folgenden Jahr, weniger als zwei Monate vor Brittens Tod, auf Schallplatte aufzeichneten). Sacred and Profane erwies sich als das letzte Chorwerk für Berufsmusiker, das Britten fertigstellen sollte, obwohl er 1976 noch die Welcome Ode für Amateure komponierte und die Partitur einer Sitwell-Vertonung für Chor und Orchester (Praise we great men) bei seinem Tod unvollendet zurückließ. Die mittelalterlichen Texte wurden als virtuoses Schaustück für die fünf Solostimmen verarbeitet, aus denen das Wilbye-Ensemble zusammengesetzt war, aber Sacred und Profane ist seither gelegentlich von groß besetzten Chören aufgeführt worden, und zwar trotz der außerordentlichen stimmlichen Wendigkeit und Geschmeidigkeit, die nötig ist, um dieses überaus anspruchsvolle Werk erfolgreich aufzuführen: Die anspruchsvolle Harmonik von Brittens Spätstil verlangt ein unfehlbares relatives Gehör, wie es selbst Solisten nur selten erlangen, und das sich für Chöre, wenn sie nicht zu den besten gehören, als nahezu unerreichbar erweist. Es wäre irreführend, Sacred and Profane als Liedzyklus im konventionellen Sinne anzusehen, da es zwar sporadische musikalische Bezüge zwischen den acht einzelnen Liedern gibt, die Sammlung jedoch durch keine einheitliche Thematik gekennzeichnet ist. Das Hauptinteresse des Komponisten galt dem Nebeneinander des Weltlichen und Geistlichen, wie es für das Mittelalter typisch war. Britten hat seine Texte, von denen einige bis auf das zwölfte Jahrhundert zurückgehen, bewußt nicht modernisiert, so daß eine Zusammenfassung ihres Inhalts wohl hilfreich wäre. Das Werk beginnt mit St. Godrics schlichter Hymne an die Jungfrau Maria und beklagt dann kurz den gewohnheitsmäßigen Wahnsinn des Menschen als eine Eigenschaft, die ihn im Tierreich einmalig macht („I mon waxe wod“). „Lenten is come“ bietet eine detaillierte Beschreibung der Anblicke und Klänge des nahenden Frühlings, wird jedoch unmittelbar gefolgt von einer kalten, windigen Nacht, die den Einzug des Winters signalisiert („The long night“). Das fünfte Lied mit dem Titel „Yif ic of luve can“ schildert die intensiven Gefühle der Liebe und des Kummers, die von der Betrachtung Christi am Kreuz ausgelöst werden. Die Stimmung wechselt jäh zu respektloser Parodie im anschließenden „Carol“, in dem eine pastorale Szene mit einer Maid, die auf einem Moor hingestreckt liegt, mit bewußt banalen Harmonie- und Rhythmusschemata geschildert wird. In „Ye that pasen by“ bittet Christus jene, die an ihm vorübergehen, ihm am Kreuz Beachtung zu schenken; und die Sammlung endet mit „A death“, worin die Schilderung des Aussetzens körperlicher Funktionen im Augenblick des Todes zu einem überraschend unbekümmerten Schluß führt („Of al this world ne give I it a pese!“—„Um diese Welt scher ich mich nicht im geringsten!“).